A recent trip to the Caribbean island of Dominica (not to be confused with the Dominican Republic), has given the typical beach vacation a cozy-cush new identity and it’s secret has been kept under wraps for far too long. Having lived in the Hawaiian islands for a long stint, a visit to a tropical, lush island with hiking and towering waterfalls would be no surprise. Definitely mistaken, I was fascinated from the fiery sunset upon approach to the minute the crisp air touched my face off the flight. In awe by the wild coastlines that lined the verdant rainforest and 365 plus rivers, this volcanic island, was a force to be reckoned with. Rightfully named the nature island, it’s valleys dotted with various fruit trees, bright-red African tulips, and a mélange of the color green explains the way of life: the way of the land. The Eco-enthusiasts will rave, the adventurous spirit will explore, and the soul searcher will leave revitalized. Dominica's natural beauty forces visitors to engage with locals, discover the rich culture and leave your inner-whine at home. The first impression of our hotel, Secret Bay, arrived long before getting to the property with their first-class driver Ryan. He greeted us with a gentle spirit, cold water and towels, and delicious dried fruits. The trip to Portsmouth, the northern caribbean coast of the island was a little over an hour long, so to be in the hands of a local who was extremely knowledgeable about the island was key. He pulled over for scenic photos and flora jeopardy, pointing out the national flower called the bwa kwaib (in creole), a wild, brilliant red flower. Although the official language of the island is English, the local population also speaks Creole, a french-based patois. Arriving to Secret Bay, we were greeted swiftly by Anna the hotel manager for a welcoming lay of the land and walk to our two-story bungalow, perched amidst a tropical, montane forest. Our floor-to-ceiling windows welcomed us with a lookout over Tibay Beach - our jaws dropped and were quickly recovered by a refreshing rum punch and fresh fruit. We literally had stepped off the front page of the November 2013 cover of Travel + Leisure magazine into our own secret treehouse. The brilliant and personalized concept behind Secret Bay is no restaurant, spa, bar or concierge needed. And the "DND" is nonexistent as it's a staff rule to ensure you escape. They give you a pre-programmed cell phone if you need to reach anyone on site, free wifi if you wish to check in on the rest of the world, and a meditation deck if you really want to unplug. The tight, small staff arrange everything, as they will deliver meals, fresh juice, arrange for massage, yoga, activities and even a private jazz musician. It’s full service minus the stiffness you might expect. There is the main Souce Shack (Souce meaning “source of water” in creole) where you can peek in and say hello to the chefs, grab a fresh juice or a set of snorkeling gear for the day. Pre-arrival you can have your villa or bungalow stocked with a fresh fruit basket, homemade yogurt, granola, as this option guaranteed a healthy start each day. Our friendly attendant Roseline arrived shortly after us to give an orientation of the bungalow. This is a smart service, as the aesthetic design and state-of-the-art appliances will make any techie go wild. Most appliances were by the innovative designer Siemens - flat screens, DVD players, iDock stations, and even smartly stocked bookshelves. We also had an electronic awning to reflect the slightest drizzle over the patio and a decked out all-clad kitchen ideal for foodies. There are a total of 6 villas and bungalows on property designed by Venezuelan architect Fruto Vivas, who also happens to be the father-in-law to Secret Bay owner, Gregor Nassief. Gregor casually stopped by shortly after our arrival and told us the significant story behind Secret Bay. He first exclaimed, “As a kid I climbed these very cliffs and played on the beaches!” Him and his wife Sandra envisioned a home atop the cliffs and once plans were mapped out, they quickly realized the footprint would take too much of the land. They wanted this familiar spot to remain as untouched and pristine as possible. Their dream home quickly became a home away from home for many, and Secret Bay opened June 2011. The sustainable practices and values of Secret Bay are quite impressive from their building methods, energy efficiency and even in-room composting is offered to guests. We also toured the villas and each have winding pathways leading to your own secret slice of paradise. The top Zabuco Villa, an ideal spot for honeymooners is perched upon stilts that provides a floating effect and sweeping panoramic views of the Caribbean Sea. Zabuco is also the name of the bwa bande tree, known for it’s aphrodisiac properties. The Guyanese floors and interior shine as the sunlight hits the airy open- concept villa as we walk through. I definitely took notice of the luxurious details, as the shower has a floor to ceiling window that opens to the outdoors and the wine fridge in pre-stocked with an impressive worldly selection. The Zabuco villa also flaunts a private infinity pool, outdoor beanbag hammock, and exclusive sundeck surrounded by wild flowers on the cliff’s edge. Secret Bay gets quite a bit of rain, promising intimacy and appreciation for a lingering cup of coffee. 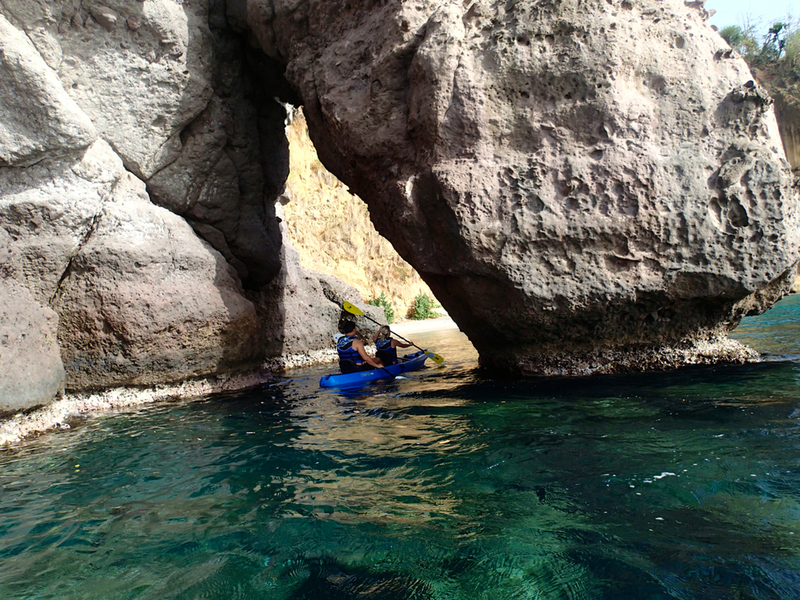 After a morning fog and drizzle the sunlight is guaranteed to surface in the afternoon just in time for beach kayaking or a tour of the magic sea cave, literally in the waters beneath the hotel. My husband preferred to call it the bat cave – possibly childhood, superhero dreams coming to fruition. Vincent, the property activity guide (and handy man) did not take us on any tour of the cave, he gave us an unexpected spelunking experience we would never forget. First, he equipped us with protective water booties, snorkeling gear and paddles. Next with waterproof camera in-hand we launched our kayaks out and paddled around the bend and through the arch to Secret Bay beach. Once parked, we hopped out and followed Vincent to a small dark opening where he politely asked, “are you okay with bats?” At a loss for words, we both curiously trusted his lead (and flashlight!) and swam through the sliver in the side of the rock. Once you swim through a first tunnel, you enter a small cave that stretches high above and you begin to hear and see the bats. Their wings make this thudding noise and you can see their shadows everywhere. It was truly an encounter I thought I would have never wanted, although fascinated with every blink. And trust me as you can tell below, my eyes were wide open! There was a small maze inside and luckily Vincent was there to guide us. Towards the end of the cave, you spot sunlight peering in which provides an alternate exit and opportunity to swim atop the coral reef and spot various schools of fish. 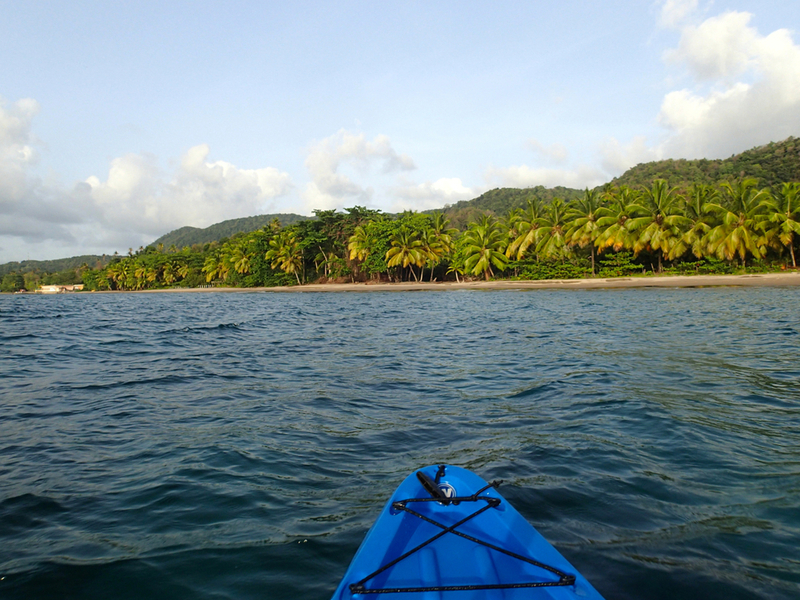 Once back at the beach, we hopped on the kayaks and continued on to our next destination, Coconut Beach. 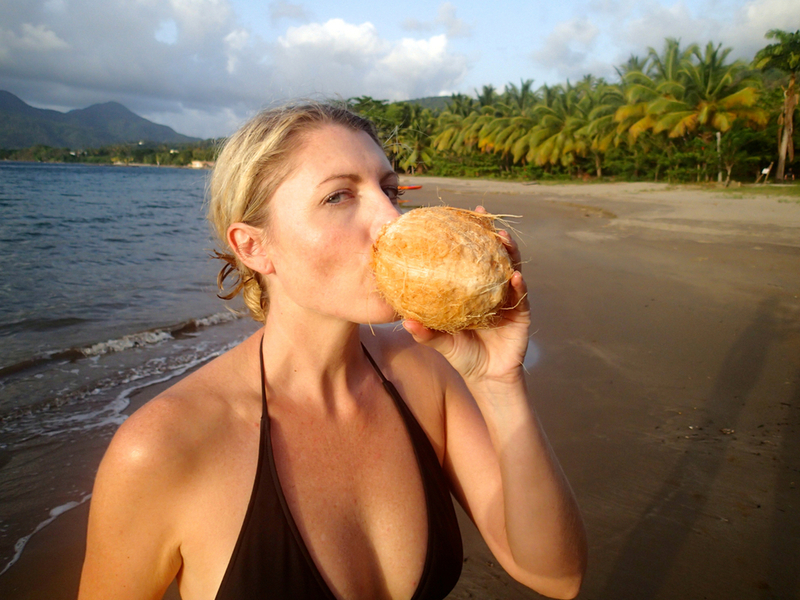 This brown sandy beach was lined with towering coconut trees and not a soul in sight. We walked with Vincent and noticed he had his eyes on the prize, the perfect coconut refreshments. He had a long bamboo pole that looked perfect for prodding, although not happy with the reach, he scaled a sixty foot tree and began throwing his picks down to the sand. We were amazed at his agility. 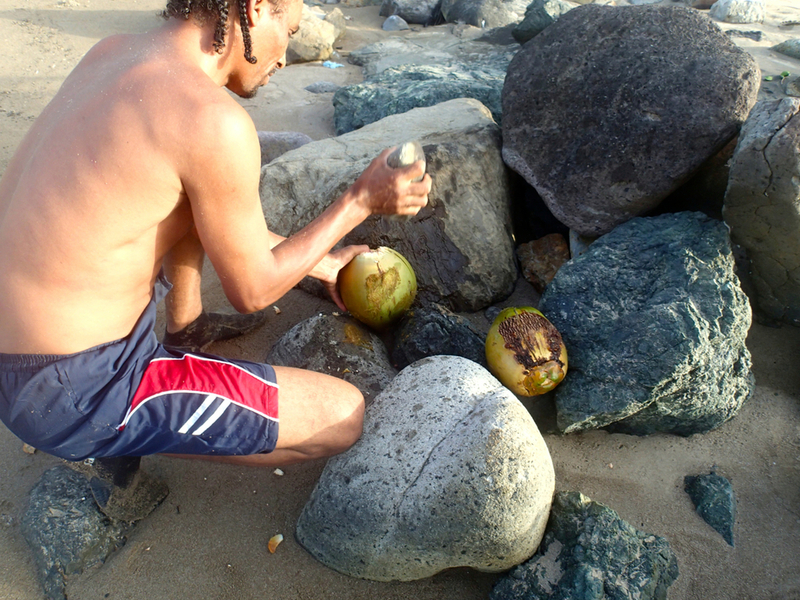 Also without a machete, which is typically used to open a coconut, Vincent began breaking into the coconuts with a rock and using his teeth to rid of the fibrous husk to get to the seed or copra that consists of coconut meat and water. We only wished we had brought a bottle of rum! After an excellent afternoon of adventure we took advantage of in-room massages by Terri. This was an excellent way to bring the experience of Secret Bay full circle - free the mind and ensure the body gets to relax. 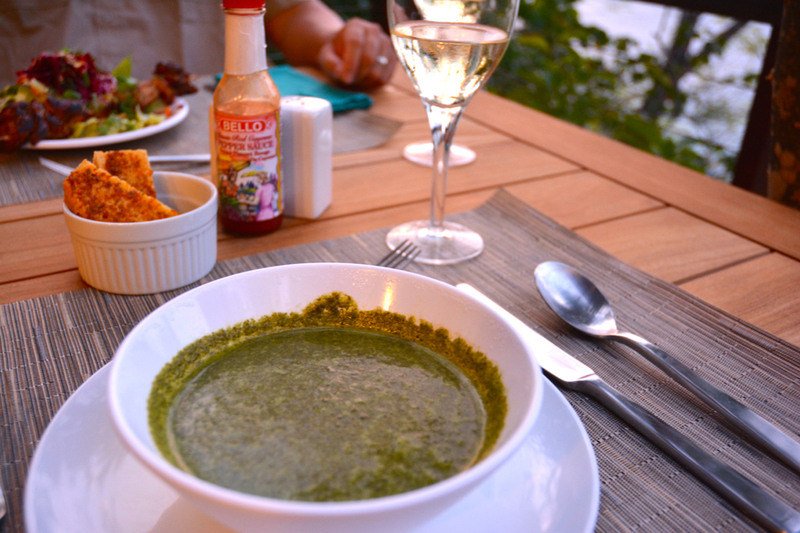 The food at Secret Bay had us hooked - vibrant, organic, and healthy with a foundation of the local Creole cuisine. Most meals we enjoyed an appetizer such as cool callaloo soup or fish cakes, then on to a fresh catch, such as a skipjack tuna paired with divine pumpkin rice and fresh greens topped with shaved beets. Being Texan, I especially enjoyed the ribs, as they were fall-off-the-bone delicious in a savory jerk barbecue sauce. After dining with Secret Bay, I discovered how luxurious it feels to eat locally sourced food and they have this element of the experience perfected. 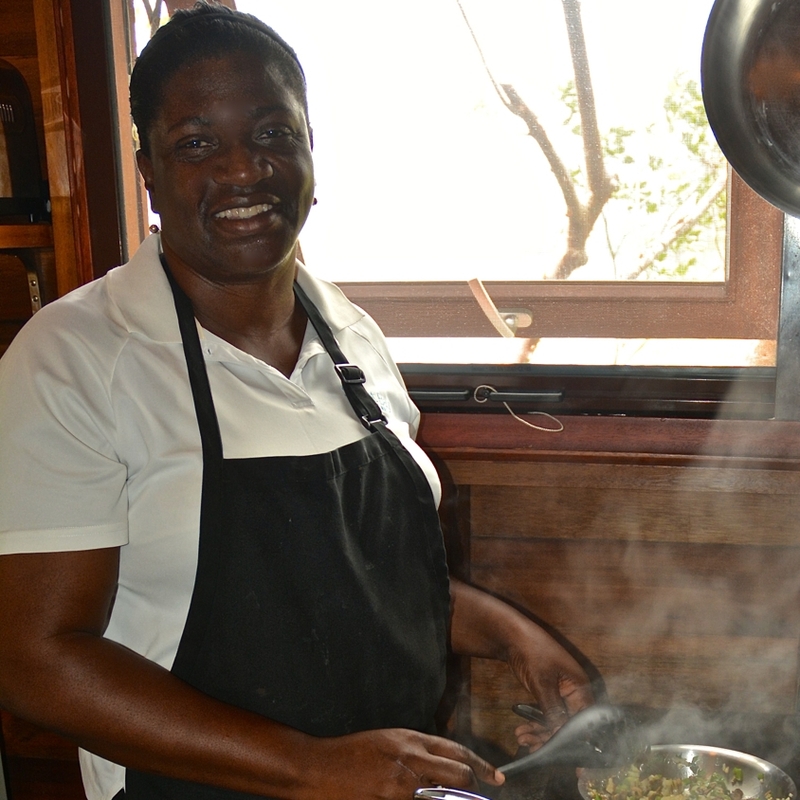 Our last day, Secret Bay hosted a cooking class with head Chef Josie and I got a true taste of the magic coming from the kitchen. We prepped a Coconut curry shrimp over mashed mushroom dashin, a local provision or starch with garlic-butter broccoli. Your villa or bungalow attendant will gladly arrange a cooking class for you during your stay as well. During our stay in Dominica we also escaped our island-cozy haven to enjoy exploring the capital of Roseau and partake in a few exciting adventures at the UNESCO world heritage site, Morne Trois Pitons National Park. Our first day being the popular guided day hike to Boling Lake. The 13 kilometer or 8 mile journey is labeled as one of the most difficult in the Caribbean and can take up to 6 hours round trip. This strenuous challenge provides excellent views, varying vegetation and a continuous rise and fall in terrain. First you hike through a lush rainforest where you hear whistling birds, then cross numerous rivers and rocks that lead to the Valley of Desolation. We made a stop to boil a few eggs in the hot waters and receive a volcanic clay mask by our excellent guide Carlos (of Jungle Bay). The sulphur is advantageous for your skin so this was a must. After traversing over ridges, and a few hours later you arrive to the final destination, Boling Lake. It is the second largest hot spring on earth, next to a lake in New Zealand, and its steaming waters are over 200 degrees Fahrenheit. 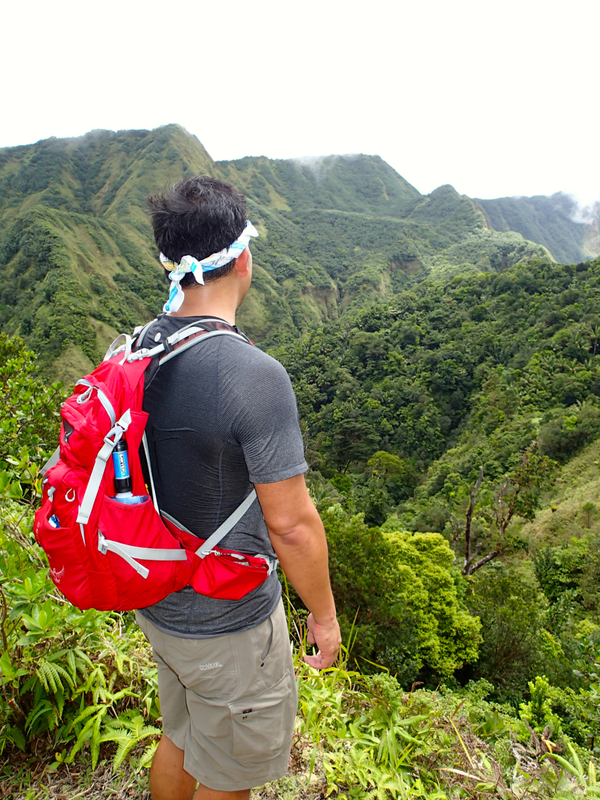 This hike is a must-do for the more adventurous and fit and will leave anyone feeling accomplished. The bounty at the end of the hike was a dip in a secluded hot spring we discovered - it was straight out of a dream. 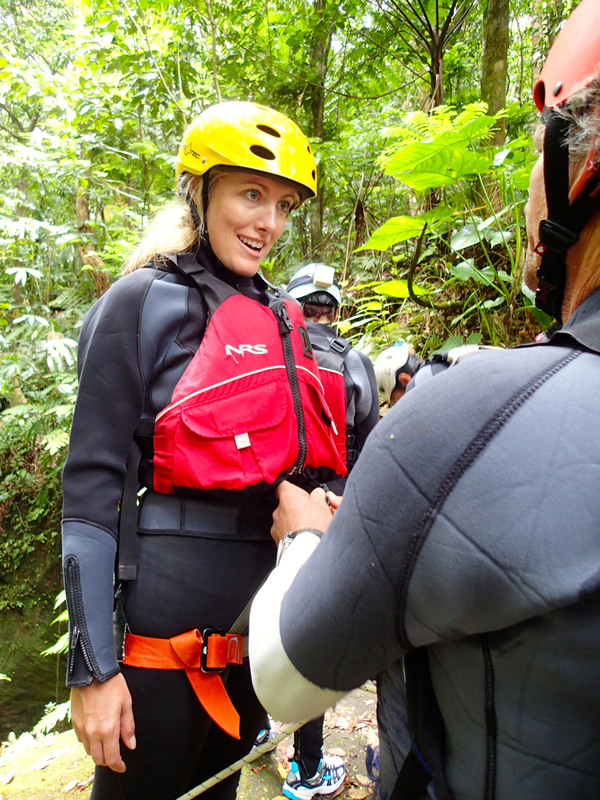 The next day we were hosted by Extreme Dominica to get our first taste of the adventure sport known as canyoning. Liz and Richard run the center and once you arrive they suit you up, gear you out and give you an orientation before you are off with your group. We were able to explore areas of Dominica you are unable to reach by foot - the beautiful crevices and canyons of the island, which honestly made our hike to Boling Lake seem a bit monotonous. Canyoning encompasses rappelling rocks and waterfalls, light bouldering, and jumping into slim spots and pools below. The best part is anyone can do it, as the team is passionate about the sport and it permeates the experience. They sing, dance, do flips, and above all make you feel comfortable and confident in trusting the ropes. 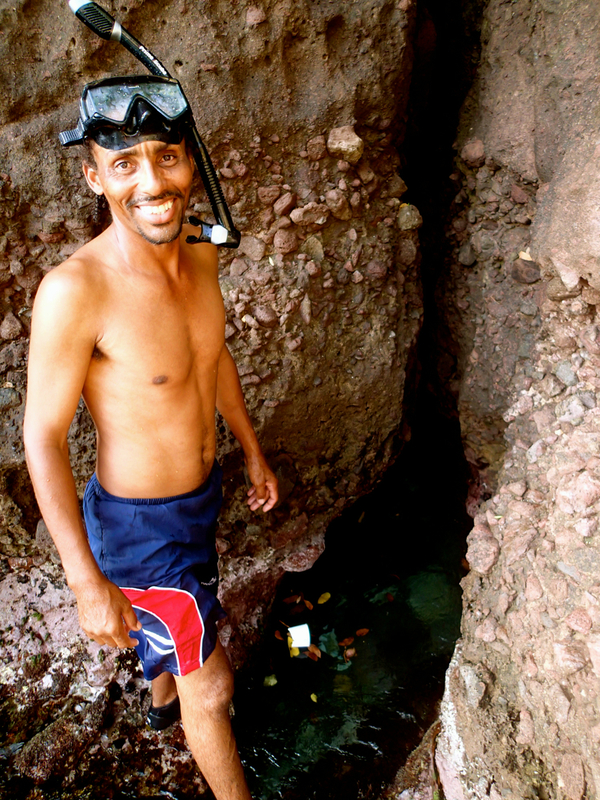 These guys are experts and will make you feel like you are on top of the world, when in fact you are deep below in the sparkling ravines of Dominica. After the short hike out of the canyons, we get back to basecamp and were greeted by Liz. She took us next door to their Cocoa Cottages, a charming guesthouse with a rustic flare. It was the perfect spot to gather for infamous Dominican cocoa tea and the best homemade chocolate cake. While indulging, Liz shared the story of how this spot was an old cocoa plantation and explained the art of chocolate making down to the process of making even the charcoal for the cocoa seed roaster. Various flavors of chocolate were passed around to include ginger, coconut and mint to name a few. This was a pleasant, warm surprise and what girl wouldn't canyon for chocolate?! This trip to the Nature Island massaged our spirits, took us on a challenging journey, and gifted us the experience we did not even realize we needed. Dominica will leave you feeling renewed and give you a natural beauty lift in all areas – your secret is safe with me! we were told this meant in creole to "hold your own!" and fittingly is the tagline to the infamous and surprisingly delicious Dominican beer Kubuli.